Here's a lovely old view of the Boulevard, with the cathedral in the background. This one dates from approximately 1926 (date amended from previous estimation - with thanks to Eddie - see comment below). Queen Victoria's statue can also be seen. Victoria died in 1901 and the statue was erected in her honour in about 1905. On the extreme right, above the tram, you can just see the top half of the Gladstone statue. Those old buses look great. Does it say Ribble on the side of them? Excellent photo, and hand coloured by the looks of it. Thankyou and I'm glad you like it. I'm sure you're right, it very probably would be hand coloured/tinted. 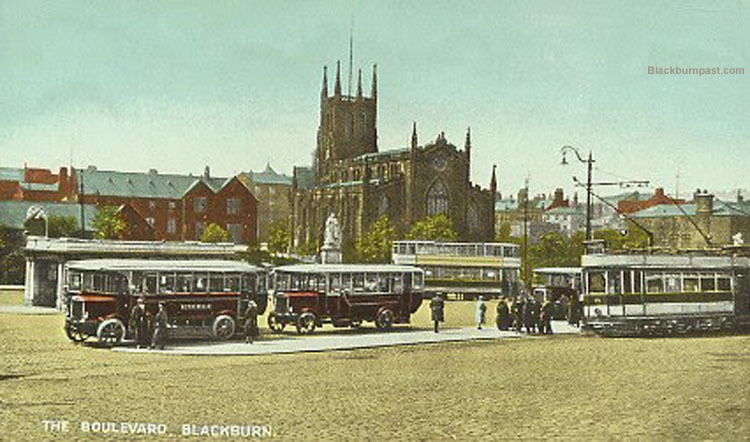 ITs later than 1908, I would put it in the 1920s Ribble did not operate buses until 1919 and then only in the Preston area,arriving in Blackburn via a series of takeovers The buses look like Leyland Lions from around 1923/24. One of the trams in the picture is top-covered the roofs were added, again around 1923 the Corporation began running buses in 1929, and the lack of these on the picture would suggest a date in the mid 1920s around 1924-1928. Thanks for the info Eddie. I have amended the text. I've also used the opportunity to enlarge the photo a little. Couldn't enlarge it too much, as I would begin to lose definition. Click on it to enlarge.